Did Facebook Just Reveal Their Plans To Sell Cinema Tickets? Facebook has inadvertently revealed its ambition to directly sell cinema tickets through its platforms. A job posting on the social media giant’s Career’s page for Sales & Marketing seeks applications for ‘Monetization Product Marketing Manager – Movies’. The senior position is based in Facebook’s headquarter in Menlo Park and would target the North American market. Technology companies such as Amazon, Google and now Facebook have been making an increasingly direct play for consumers buying cinema tickets. Facebook has already been working hard to push Hollywood studios and cinema chains to use the social media platform for promoting its films and make them the centerpiece of campaigns and engagement. The company previously sold tickets via Fandango. This role could, however, take Facebook into a much more direct transaction role that has the potential to immediately threaten third-party ticketing operators in the United States such as Fandango and AtomTickets. “This position will drive market requirements into product planning to help build solutions to help businesses successfully reach people and drive sales of movie tickets through Facebook,” the job ad explains. While there is still a strong component of Facebook’s traditional role of advertising and engagement, this is the first time Facebook has directly admitted and made moves toward being an e-commerce movie ticketing solution as well. The candidate must have experience “developing and executing against global launch plans marketing to very large numbers of business,” indicating that Facebook’s ambition is to start in the U.S. but roll out its proposition across the world. The candidate will work “closely with multiple product teams, Partnerships, Research, and Marketing teams,” indicating that Facebook is possibly preparing to put major resources behind this. Qualifications include a BA/BS degree, “[e]xperience working in a cross-functional capacity within a changing environment,” and seven years work experience, including two years working in product marketing or product management capacity. Bonus qualifications include an MBA, experience “working with Advertising or movies/entertainment” [interesting to note that this qualification is optional], and experience in fields such as strategic consulting, brand management, ad operations and more. While Facebook is looking to hire somebody it does not mean that Facebook will definitely launch a cinema ticketing operation. Major technology companies such as Alphabet (Google’s parent company), Amazon and Apple often launch major R&D operations that ultimately don’t result in a product (such as Apple’s fabled car or Google Glass), but sometimes turn out unexpected hits (Amazon’s Echo). However, it seems that this position is not some Facebook ‘skunkworks project‘ but a clearly defined part of the company’s strategy. Technology giants have been sniffing around cinemas for a long time. 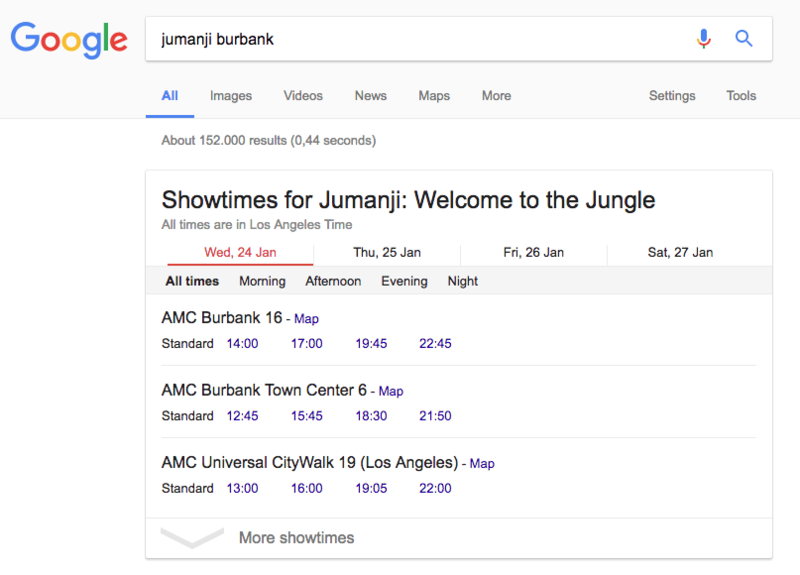 Google has been working hard to show cinema and film listings top of its search results (see above), after shutting its Google Showtime in 2016, thus meaning that web users don’t have to go via other third-party platforms but can click straight through to the cinema’s online box office. Amazon has not launched any one-click solution for buying cinemas tickets, but late last year offered cinema tickets for “Jumanji: Welcome to the Jungle” one week early for its Amazon Prime members in the United States. It is very likely that the success of MoviePass caused Facebook to pull the trigger on its own cinema ticket e-commerce venture. While the social media major is not expected to launch a rival service to MoviePass, it is clear that Facebook is keen to tap into the data that is being generated by MoviePass’ 1.5+ million strong consumer base. J. Sperling Reich contributed reporting to this post.